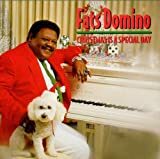 Fats Domino's, "Ain't That A Shame "
This song may have a nice, jazzy beat to it (as is true of nearly all Fats Domino songs), but that doesn't change the fact that it's sung from the point of view of a guy whose girlfriend/wife/whatever has left him. You're part of me still. Although the tune is upbeat and the breezy setting stirs with nature's vibrancy, and "love's sweet melody" is referred to, the song is basically a lament about lost love.